T M 1 7 . 18. 19. 9-2350-261-20-2 Remove screw (1), lockwasher (2), clamp (3), and harness (4) from rear hull plate. Discard lockwasher. Remove two screws (5), lockwashers (6), and guard (7) from two weldnuts (8) on rear hull plate. Discard lockwashers. Remove two screws (9), locknuts (10), clamps (11), and harness (4) from guard (7). Discard locknuts. 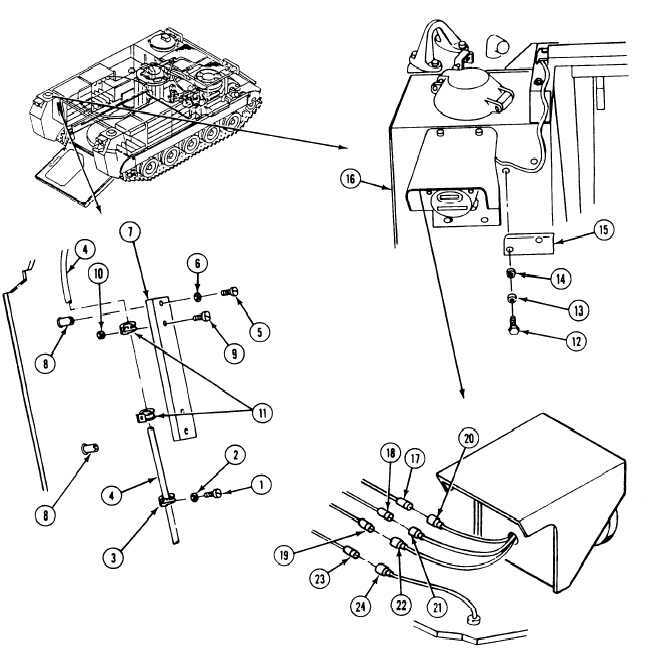 Remove two screws (12), lockwashers (13), washers (14), and harness guard (15) from top of left fuel tank (16). Discard lockwashers. Disconnect circuit 21, 22, and 24 leads (17, 18, and 19) from left tail light leads (20, 21, and 22). Disconnect circuit 30 transmitter lead (24) lead (23) from fuel on left fuel tank (16). 12-118.4 20. 21. 22.